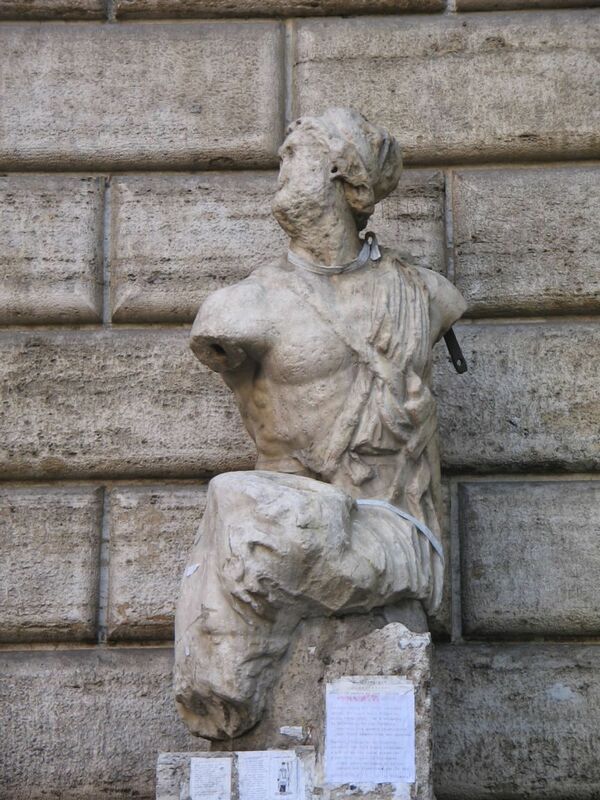 Pasquino, the most famous “talking statue” in Rome. Used since the 16th century to post messages and claims. Lately I find myself thinking about language a lot. In Rome one hears a polyglot of tongues, from French and German to Swedish, Senegalese and Chinese. I have been asked for help by a Chinese tour guide, whose English was perfect, but who knew only the fewest words in Italian. In the market I heard an immigrant vendor speak almost simultaneously in Italian, English, German and Pakistani. On a bus headed to via Appia Antica, a French woman sought help in Italian, but the bus was full of Germans and English-speakers, no Italians. I was surprised to find my Italian was the common denominator as she spoke no English and we managed quite well in our shared foreign tongue. Yet English is the usual common denominator, the language in which an Italian and a German, for example, will engage to find clarity. What do you call a person who speaks three languages? Trilingual. What do you call a person who speaks two languages? Bilingual. What do you call a person who speaks one language? American. I want to be fluent in Italian, but my progress is so erratic. One day I am sailing through the Roman landscape, doing my errands, giving directions in Italian to people in the street (people are always asking me for directions), answering the office phone without totally losing my cool at the sound of an Italian voice, and navigating the whole hospital experience. I learn something new in Italian every single day and think how marvelous it is that after less than 6 months in Rome, I am not only surviving but thriving. Then the next day, I am totally flummoxed when the fishmonger asks me how I am going to prepare the fish. Dashed by the reality of my limitations, I struggle to stand up and walk talk again. I tune in-and-out of conversations around me. Some days it is just too difficult and I revert to tourist-speak or totally block-out the people speaking mellifluous Italian around me. I was in my doctor’s office again the other day for post-surgery bandage removal. He and another doctor were chatting away while they cut off the mummy-wraps. I know they wondered if I was following along, and in fact may have been gauging my comprehension, but I was on a different plane. I was a bit stressed and had much on my mind that day (not to mention the fact that they were wielding scissors across my tender thighs). I tuned out when it would have been a marvelous opportunity to practice. Will the day come that I comprehend everything being said around me? When we learn a language, we accomplish so much. It honors the people and the culture. Learning the language allows us to stand on our own and helps us navigate challenging situations without having to pray that someone else will come along with the language skills to help. I’ve written about how great the hospital staff was, and because we each knew some of the others’ language, with un misto di lingue I made it through. But what if Ric and I land in a situation where there is no misto? What if I have to make a go of it in Italian for health, safety, or legal reasons? I must become fluent. I have no right to assume someone will speak English here for my convenience. When we learn the local lingo, we can participate in a conversation, not simply ask and answer survival questions. On a personal level, I want to be able to engage people in Italian. I envy these very social people who can chit-chat about anything, everything, and nothing. Mastery will allow me to better serve my employer and represent my country. I want to be able to make people laugh in Italian on purpose, not because I am so terrible at it. I am going to work comprehensively on one new vocabulary word a day. This means not a simple definition, but to more fully understand words with multiple meanings, words that are nouns and verbs, words that have colloquial expressions intimately tied to them. Here is a link to this same material in Italian. (GoodDayRome, now in Italian, too!) By the time I post this, it will have been edited by my instructor as I have made this a part of my formal training. Over time, I pray the correction ratio will plummet as I get stronger. I read, in awe, this post. To me you have accomplished so much. Your commitment will get you to where you want to be! Has anyone ever told you that maybe you are a tad hard on yourself sometimes?! Keep the patience! Happy Thanksgiving to you and Ric. Sounds like you have a wonderful day planned. Thank you Carolyn! As always you lift me up. Yes, I may be a bit hard on myself. Always have been . Not stopping now. 🙂 Happy Thanksgiving to you, too! This posting made me think of an article I read a few years ago about how difficult it was to have a personality when you’re speaking a foreign language – your parts of a conversation consist of what you can say rather than what you want to say. I think ypu’ve already started to pass over into being able to say what you want to say. Your reference to a 3-year-old reminded me of an experience on a bus in San Francisco’s North Beach. I was about to congratulate myself for the improvement in my Italian, thinking I could speak almost as well as the child I was listening to. Then I looked up and realized he was just learning how to talk. You’re a great role model for us all. I love your addition of the Italian version! Dear Julie, I received your comment while we were waiting to be seated for dinner last night. Ric and I had a great laugh over your 3-y-o story! In fact, little children know words that I do not encounter. I don’t know the names of most animals, or insects, or toys. I can discuss my surgery in Italian, but not life on a farm. Ha! In fact, I bought a Richard Scary children’s storybook so I can learn some of that vocabulary from growing-up. It is a wonderful gift you are giving your children, Susan! Perhaps one day they will say “Gracias, Mam�.” I appreciate your encouraging words, too. We will miss our Thanksgiving tradtions, too. We are not going to even try to replicate! I calculate I’ve cooked at home 23 out of the 29 Thanksgivings Ric and I have been together. We will go on a daytrip somewhere and eat a fine Italian meal. Maybe I’ll make a turkey over the weekend just because we love turkey. Saturday we are seeking out the elusive “patata americana” (sweet potato) at a local outdoor market. I love bake sweet potatoes! Love to all! As always, beautifully articulate, compassionate, and respectful! In any language you are a jewel! I very much enjoyed reading this articulate and interesting description of your Italian language experiences. I can absolutely relate to some of what you described. I also find that some days I seem to manage quite well, while on other days I really struggle and prefer to stay in my “comfort zone” and use English. I’ve noticed that some days I just get “lazy” and don’t work at it too much, and that’s when my pronunciation suffers. On those days when I’m doing well, I so much appreciate the ability I have to at least partially function in another language. It’s definitely something I want to continue learning. Your Italian Instructor sounds wonderful, and based on what you’ve said it sounds like she’s helping you to progress very quickly. At this rate, you’ll be completely fluent in no time! Unfortunately I’ll have to continue for now with Pimsleur (not perfect but it’s the best I’ve got at the moment), the occasional night school College courses and self study. Ciao Ken! Thank you for your thoughtful comment! I know you know how I feel! I can heartily endorse having a private instructor that can adjust the lessons and material to my needs and interests. Laurel, I’m so excited by this post on language! As Diana said, I know you are doing better than you imagine. Sometimes progress seems slow in the intermediate stage, but believe me it is happening. I bet if yoi had a recording of how you spoke six months ago you’d hear a big difference! You might want to record something now and save it so you can compare after a year or two. Hang in there la mia amica! An interesting idea! I have been told by some Italians that my pronunciation is good. I consider that a grand compliment! When are you going to come and see us? I think you are awesome that you can truly speak some Italian. I know you are better than you think you are. I hate only being able to speak English so I applaud you. How is Rick doing? Is he picking up the language? Ric is working on it. More words every day! Bravo Laurel!!! You are an awesome ambassador for the USA!! *Grazie, cara! * It is sobering to realiza how far have yet to go.